(The second bridge with the swing open and travelers waiting on the bridge. The history of the three bridges to span the canal between Houghton and Hancock. Being an engineer at heart and by profession I have always held a fascination for bridges. Without this technology, life as we know it today could hardly exist. In the early days of our countries development people used the water as we use roads today. Cities and towns of these early days existed because of the transportation routes the rivers provided. As technology improved and cities grew we found the need to cross the rivers instead of following them. Bridge technology paved the way for the future of our great nation. As wagons changed to automobiles and stagecoaches changed to trains we found the need to develop bigger and stronger bridges to carry their ever increasing loads. As we further developed we found the need to cross lakes and even oceans in our pursuit of growth and prosperity. The zenith of this technology is evident in the building of the Golden Gate and Mackinac Bridges which both span miles of water and to most are more art than technology. The history of the single span to cross the Portage between Houghton and Hancock developed in much the same way as I have just described. My fascination with the present lift bridge began the first time I saw it and continues today. Having a great interest in history as well as engineering drove me to learn more about how it got there and what life was like before it. In my search I discovered that not one, but three bridges had been built on this spot and each one added value to the generation it served and each one had its up's and down's (sorry for the pun). Discovering the history of these bridges allowed me to gain a deeper understanding of the history of the communities that surround it, as it is the communities that built them and rely on them for their very existance. I. The days before the bridge. The Copper rush began in 1843 at the tip of the Keweenaw peninsula. The harbor towns of Eagle Harbor, Eagle River and Copper Harbor grew out of the dense forests and became the early focal points of this new mining region. During this same time the area around Houghton/Hancock was nothing more than a place for native americans and early explorers to cross the Keweenaw. Crossing the Keweenaw by canoe was made possible by Portage Lake which cuts the peninsula in half, extending from Keweenaw Bay on the east end and almost to Lake Superior on the west end. The final two miles were cut off to larger boat travel by a sand bar which reduced the depth to a couple of feet. In 1847 Ransom Shelden built the first structure on the Portage waterway near Keweenaw Bay. When copper was discovered on the hills above and below the waterway Mr. Shelden quickly moved his store to Quincy mine in 1851. Still not satisfied he moved to the southern shore in 1852 and erected the first building within the present day city limits of Houghton. Within a year of this construction, and along with the development of several mines in the vicinity, the first ferry was operating across the lake linking the two developments. By the time of the American Civil War numerous ferry companies were hauling passengers and cargo across the lake. Continued development of Houghton and Hancock after the war produced bottlenecks for traffic crossing the lake and something had to be done. In 1871 a charter was developed to build a 24 foot wide wooden bridge to link the two communities. A total of $50,000 was required but the panic of 1873 ended all hopes of evening starting the project. The towns settled instead on a 100 foot double ended scow that was attached to both shores by means of a cable. The scow could handle 8 teams of horses but everyone knew this was nothing more than just another boat plying the Portage. By the time things had returned to normal again in 1875 a total of $47,000 was raised to finally start the project. II. The first span, a wooden draw bridge. During the winter of 1874 a young civil engineer by the name of Edwards reviewed the earlier ideas for a bridge to span the Portage. He was taken with this plan and with the help of a few large investors and by selling stock to citizens from both towns the money was finally raised to start work on a wooden bridge. 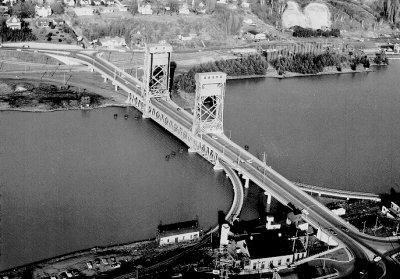 The Portage Lake Bridge Company was born. The construction firm of Fox and Howard of Chicago was commissioned by Edwards and started work in the spring of 1875. They worked through the year and on Christmas day 1875 the bridge was finally open for traffic and both cities rejoiced. Unfortunately their revelry lasted but one day. The day after the bridge opened a land slide of Quincy stamp sands fell down upon the structure and carried away 200 feet of the north end into the Portage. It was a good thing that the ferries were still operating as they were called back into full service until the bridge was repaired in the spring of 1876 which required an additional $5,000 of capital. In 1883 the Mineral Range Railroad applied to Houghton County to have a railroad bridge built about a mile east of the wooden bridge. The Mineral Range was under pressure from the newly formed Hancock & Calumet and were very interested in completing their "Houghton Extenstion" to gain access to markets south of the Portage. 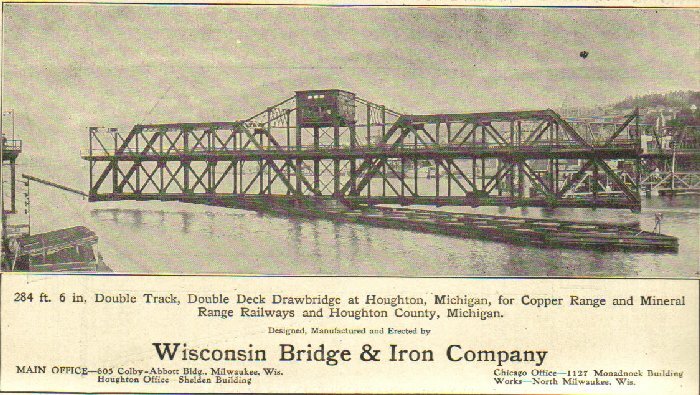 Also fearing that the M.H.& O. would bypass Houghton on its way to the Keweenaw the city fathers urged, or better yet forced the Bridge Company to add another level to the bridge to handle both railroads as well as the normal foot and hoofed traffic. The first passenger train to cross the Portage was on March 26, 1886 from Houghton to Calumet, although a freight train ran the day before, both under the Mineral Range flag. A third rail was added to allow the M.H.& O. to cross the span. The Mineral Range also purchased a standard gauge engine and coach to move passengers between Houghton and Hancock in what they referred to as "commuter service". 1891 was a year that ushered in many new changes in the way transportation was controlled in the Portage Lake area. The entire Portage Lake water system had been under the control of the Portage Lake and River Improvement Company since the time the channel had first been dredged in 1860. The Improvement company was responsible for keeping the lake open to navagation, and being a private company charged fees to any ship drafting more than 5 feet. These costs kept the amount of ship travel to a minimum until 1891. In that year the United States Government took over the responsibility for improvements and maintenance. Fees were eliminated and lake travel began to swell. During the peak years from 1891 until 1910 the lake saw an average of 6,000 ships per year cross the lake. 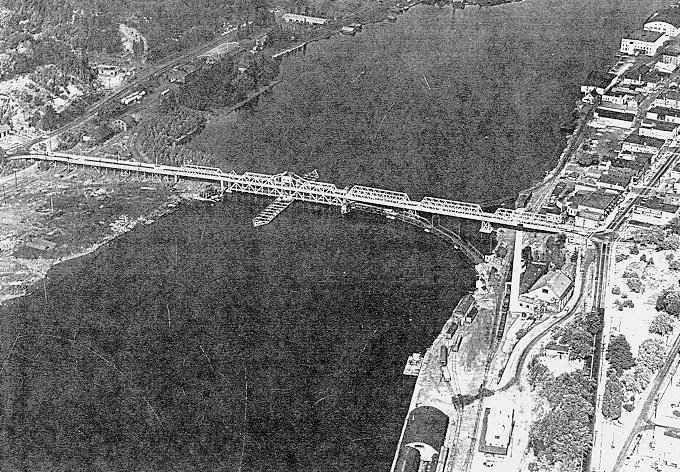 The Portage Lake Bridge Company also felt the changes that 1891 would bring. Citizens of Houghton and Hancock began to realize that they had paid for the bridge many times over in the fees charged by the company and in that year the company was forced to give up the rights to the bridge and promptly handed it over to the County at no cost. The fees were eliminated as soon as the County took possession. The wooden bridge was never a marvel of engineering and the safety of it was always in question. All questions were answered in 1895 when the bridge was rebuilt, this time with steel. III. 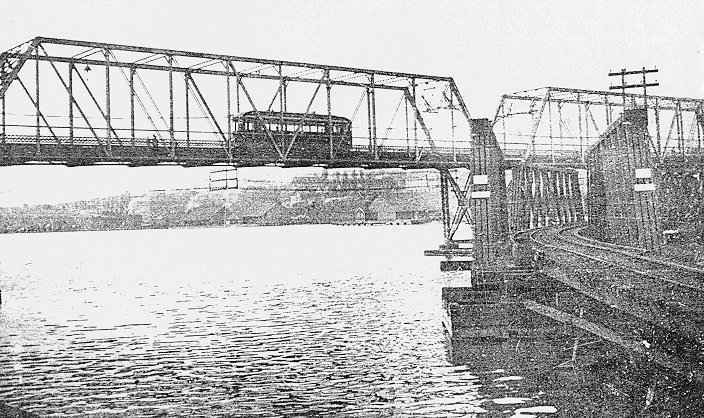 The second span, a Steel Swing Bridge. The second bridge was indeed constructed of steel, all except for the draw portion which was still made of wood and was powered by a stationary steam engine. These were also the days of street cars and the Houghton County Traction Company had a single track placed on the upper level. The Mineral Range / M. H. & O. RR track was located again on the lower level. The wooden lift lasted all of 3 years as in 1898 the Mineral Range applied to Houghton County to replace it with a steel swing span. The County accepted and the Mineral Range paid the bill. The swing span was 180 feet in length. If the Mineral Range hadn't been quite so hasty they might have had a partner to help cover the cost of the swing span. In 1902 as the new Copper Range Railroad was completing their trackage south of the Portage they set their sights on moving north to Calumet. A "Y" running from the Copper Range yard to the bridge connected with the Mineral Range track on the bridge. Both railroads developed an agreement on how the traffic would be handled across the bridge. A series of interlocking signals and train whistles controlled the movement of trains across the bridge. At 4:30pm on April 15, 1905 fate struck the span once again. The captain of the steamer Northern Wave, while setting up to collect a shipment of copper from the Quincy smelter, mixed signals with the controller of the swing bridge and struck the swing span. 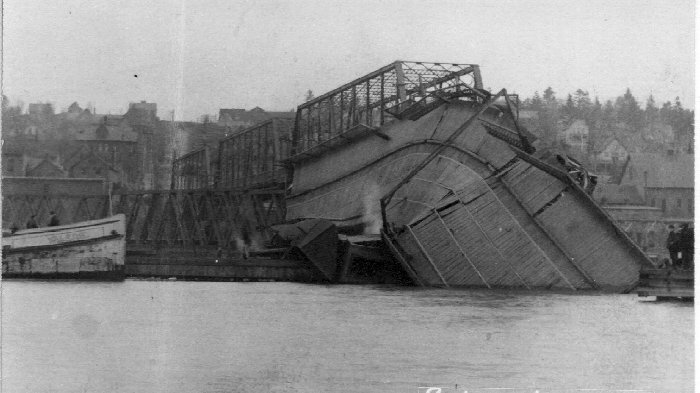 Although the steamer was almost stopped the span toppled over into the Portage. Ferries once again returned to the lake to carry goods and citizens across the Portage. The mess that the toppled span left in the Portage was equaled by the confusing that was created by the ferries. Two days after the accident a ferry loaded with a locomotive tender and gondola toppled off a scow and slipped into the lake. Soon after this a temporary wooden bridge was built across the lake to handle rail traffic as nearly 40 trains per day were crossing the bridge by this time. Citizens complained about the fees being charged for the ferry service, as it seemed that a few were making vast sums of money on the misfortunes of many. The clean up and reconstruction took a year and was paid for by the Mineral Range, Copper Range and Houghton County. Ferries ran through the summer. During the winter when the new span was being constructed, traffic moved across the ice. When the ice broke up a series of barges were strung together to create a temporary bridge to handle the traffic. By the 8th of April 1906 the bridge was back in operation. The swing section was increased during the reconstruction from 180 feet to 290 feet. The life of the second bridge returned to normal until 1921. Before this time the road systems in Michigan were under the control of local governments. Increasing auto traffic moved the State to develop a trunk line Highway system which would link the state together under one controlling body, the State Highway Department. Improvements and maintenance was now performed by the State, as authorized by the State Highway Commissioner. In 1929 the bridge surface was rebuilt using prefabricated concrete slabs over 6x6 timber cross ties. 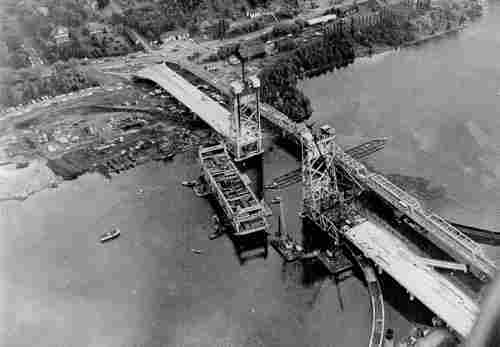 This remained until 1948 when steel I-beams replaced the timbers and concrete was poured to smooth the surface. The entire structure was cleaned and repainted aluminum in 1952 as the bridge neared the end of it's life. One interesting problem with this bridge was the fact that the swing section would expand during very hot weather and the fire department would have to be called in to wet the bridge down to shrink it back down so it could be closed or opened. Winter cold was no more friendly as the gears and turning mechanism would build up with ice and would have to be hacked away to turn the span. The new bridge would leave more time for the fire department to tend to normal duties. IV. The third span, the heaviest vertical lift bridge in the world. As lake freighters using the canal to bypass Lake Superior storms began to increase in size the old bridge could no longer accommodate these vessels. Although the swing section of the bridge was 290 feet in length only half of this distance could be used for the passage of a single vessel. New technology was required and it was found in the American Bridge Division of United States Steel Corp. of Detroit who were choosen as the prime contractor for the new bridge. Work was completed in 1959 and was dedicated in June of 1960 at a total cost of 13 million dollars.. A vertical lift design was choosen and sub-contractors from Michigan, Minnesota, New York, Pennsylvania, Ohio and Wisconsin were called upon to help build this massive structure. The new design allowed for a clear channel width of 250 feet which could easily handle any Great Lakes vessel afloat. The lift span weight was 4,400,000 pounds making it the heaviest lift bridge in the world and when fully raised provided 100 feet of clearance. The new bridge also made it easier for automobile traffic as the lanes were increased from 2 to 4. The new design also allowed for rail or vehicle traffic on the lower level so the bridge could be raised to an intermediate level to allow for small boat travel without hindering vehicles. The bridge was kept in the lower position which allowed only 7 feet of clearance when train traffic used the bridge. When there were no trains the bridge was raised to the intermediate level which provides 35 feet of clearance. The number of trains crossing the bridge daily in the 60's was less than 5. Today no railroads enter the Keweenaw so the bridge is left in the intermediate state and the rails have been removed, only the "Y" bridges remain. The machinery rooms which move the lift section are housed 180 feet above the waterline. 16 foot gears pull on 42 prestretched steel cables on each side of the span. At the other end of the cables lay 1,100 ton counterweights which help to raise the section. Michigan Technological University Archives and Copper Country Historical Collections. Copyright 1997 by Kevin E. Musser All rights reserved.